Best-selling mystery author, Lee Child, urges writers to break rules. Like the rule, “Don’t start with the weather.” To which Child advises, “If the weather is what’s on your mind, start with it.” The weather has been on my mind. This is the time of year in Puget Sound when it’s finally warm enough to sleep under the stars on the futon I dragged onto the porch. To eat breakfast at the card table I set up on the deck. To wear short-sleeved shirts and sandals without socks. Spring lingered beyond most people’s patience here, with cool, rainy days all throughout June. The sun broke through just in time for the 4thof July parade and the fireworks, followed by a week of still air warmed to the upper 70s—a heat wave for these parts. The peas in our garden responded by lengthening and plumping within hours, requiring harvesting morning and night. The pole beans started tendrilling up the twine support my husband built. Yellow flowers dotted the tomato plants and teacup-sized yellow blossoms sprouted from the ends of the zucchinis. 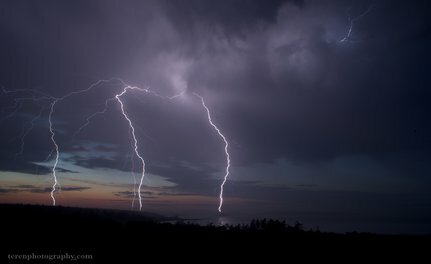 Several times last week, though, lightning ripped through the early evening blue sky. Thunder rumbled in the clouds like colliding bowling balls. Bucketfuls of rain and hail pelted the raspberries, tomatoes, and the clothes on the line. Such weather is uncharacteristic here, but it brought back memories of the summer storms of my childhood in the Midwest. A few nights ago, as my husband and I settled in after dinner to watch a new episode of Downton Abbey, lightning again tore the sky and brightened the dusk. Lights flickered once, twice. He unplugged the TV, lamps, and the computer; I lit candles. Another crackle darkened our house and all those on our road. I snuggled under the soft hand-woven throw on the couch; he leaned back in the recliner. We talked lazily, shifting from one subject to another like the hummingbirds flitting among the red lilies in the garden. About the kids (now grown and both living on the East coast) and where we might all rendezvous for Christmas. About how to reinforce the frame for the bird netting over the raspberries. About putting out the crab pots for the first time this season. The candlelight blinked and went out, the house darkened as the sun sank below the horizon, and our eyelids fluttered. Rain tap-danced on the metal roof as we headed upstairs, rummaged through drawers for headlamps and flashlights, and settled in with our books. The next morning, the flashing red digital numbers on the electric alarm clock signaled that sometime during the night, the power returned. As quickly as spring had turned to summer, the season had shifted again with the premature arrival of morning fog. The milky drape usually doesn’t pale sunrise until August—the month we refer to as “Fogust”—but this year it’s appeared mid-July. The ferryboat’s bass horn called us to rise. The computer is back on, we have Internet access again, and we’ve returned to following the rules of to do lists and tasks. I don’t intend to romanticize the power outage. I know the loss of electricity can devastate businesses and put fragile people at risk. Fortunately, I haven’t heard of any severe damage from last week’s storm. But with the weather on my mind, I’m rethinking my self-imposed rules about productivity. Might be good to sit by candlelight more often and break some more rules.